Bees buzz in the Lavender, Swallows swoop in and out of eaves and the ice gently clinks in G&T’s. July is here and with it a riot of flower fireworks bursting in British gardens across the land. Through open windows, the soothing whack of rackets against balls can be heard as tennis’ greatest world grass court stage, Wimbledon, gathers pace towards a wonderful weekend of thrilling Championship finals. More Pimms please! Quintessentially English events of all sizes abound – village fêtes, plant fairs, cricket matches, music festivals and more. At Garden Requisites, we particularly love the garden shows of course and up there with May’s super-distilled essence of garden shows, RHS Chelsea Flower Show, is the suitably summery, more laid-back RHS Hampton Court Flower Show. Flanking both sides of the ancient Long Water at Henry VIII’s 16th century Hampton Court Palace on London’s outskirts, the RHS Hampton Court Palace Flower Show is the world’s largest annual flower show. The show takes place in full British summertime in July when Chelsea Flower Show is but a memory. Lucky garden fans have plenty of space to explore top Garden Designers’ Show Gardens, the Rose marquee, floral marquee, plant pavilions and many more exhibits. Chelsea stretching its legs! To be inspired by the latest garden designs, colour and plant combinations, do pop over to our Hampton Court Flower Show Pinterest board. We’ll be adding to it over the next few weeks. Hampton Court Palace Flower Show and Wimbledon typify a unique flavour of British style and heritage. ‘British-made’ has a magic to it that harnesses hundreds of years of evolving tradition, cleverly and carefully updated to suit the present day and age. The same can be said for our own British-made garden metalwork, which draws on simple, proven designs from the past, tweaked with new processes to strengthen and improve them even more. Find the flavour of these processes in the making via our handcrafting video, filmed at the Garden Requisites workshop near Bath. With inspiration from the big flower shows of years passed in mind, it’s exciting to think of all our customers seeing their garden planting plans come to fruition. We would so love to see the results of fully grown summer plants, climbing Garden Requisites’ handcrafted metal trellis, obelisks, garden arches and gazebos. To this end, we are pooling customer photos of their metal garden structures in their final homes, to share on the Garden Requisites website. If you are the proud owner of any of our products, please do take a picture to capture the full glory of your planting project and email it to info@garden-requisites.co.uk. Participants will receive 10% off their next order. In the meantime, no pressure. 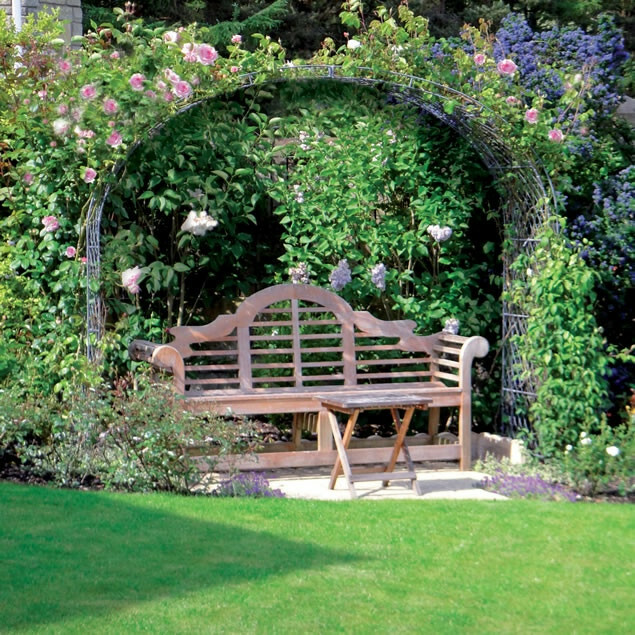 Make sure you all take time to sit back and enjoy your gardens at their very best. Don a straw hat and don’t forget that tray, laden with jug and glasses of Pimms and generous bowls of strawberries & cream.